All-in is a move you see quite often during poker tournaments. 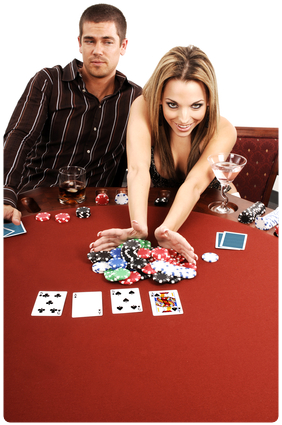 It shows that the player is confident enough to risk all his (or her) chips or reckless enough to do the same thing. Going all-in can be a good move in certain situations, and the worse possible move in others. Here are a few tips borrowed from professionals on when and when not to go all-in during a game. When you are sure (or at least very confident) that your opponent doesn't have a hand better than yours. Of course, you can never be 100% sure, but closely watching your opponents' reactions and betting patterns, as well as monitoring the cards being dealt can help you pretty much. When your opponent is one card short of creating a winning hand - like a straight or a flush. Going all-in can prevent the player to get the card needed for such a hand, and ultimately win the round. Knowing when not to go all-in is as important as knowing when to do it. Each poker round is different, and you have to analyze the situation to know if the moment has come to push all your chips forward. If you have a good hand, but the pot is low and most other players have folded there is no use in going all-in. Doing so will scare the other players into folding and your winnings will be insignificant in the end. Even the best poker players lose sometimes, but they also learn from their losses. Always try to learn from your losses, analyze the situation and try to pinpoint what went wrong. Don't be bumptious - admit when you went all-in like a fool, and avoid repeating the same mistake in the future. The starting hand is among the few things that are decided by chance in poker. Relying on your starting hand only and going all-in is almost like playing at an online casino - you leave everything to chance. A solid starting hand is a good thing, and sometimes it alone is enough to win you the round, but much can depend on how things unravel later on. This is for those playing poker in real life: keep a poker face! Avoid the tilt, keep your head cool. Letting yourself be run over by emotion, frustration or joy, can lead to bad poker decisions, and can - and will - be used by your opponents against you. As always, learning the skills needed to make the best all-in decisions takes time and lots of practice. Understanding odds and how to use information about your opponents against them can significantly increase your chances of winning.